Malts.com specializes in selling single malt scotch whiskey brands and has created the ‘Flavour Map’ to take the guess work out of selecting a whiskey according to taste. 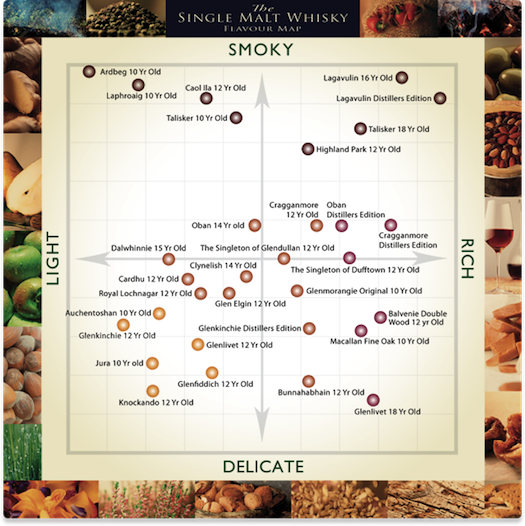 Different whiskey brands have been sampled by professional experts and are categorized on the two-axis chart to indicate its balance of distinct aromas: such as light, delicate, smokey and rich. The simple matrix allows consumers to easily explore and comprehend product differentiation between various labels. A person who likes light and delicate flavors can try the Knockando 12 Year Old whiskey, or go with something completely opposite like the Lagavulin 16 Year Old that’s more smoky, rich and full-bodied.